Subtle sweet taste. Rich in plant protein. + Calcium & vit. B2, B12, D. Far too lovely to call plain. 100% plant-based. Nutritious and rich in high-quality soya protein, which contributes to muscle maintenance. Easy to digest as naturally lactose free. Low in sugars. Naturally low in saturated fat. Free from dairy and gluten. Proterra certified - sustainability non-GMO soya. Free from colours. 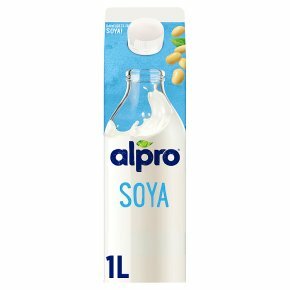 Suitable for vegans.The subtle sweet and creamy flavour of Alpro® Soya will brighten any breakfast. It isn't plain, it's plain delicious!